Business Class fares have dropped significantly in the past couple of years. It’s not uncommon to see Business Class fares from Europe to Asia for ~€1200 or less these days. One of the airlines routinely offering extreme low Business Class fares is Qatar Airways, Skytrax 2015 Airline of the Year. In May, I flew Qatar from Brussels to Bangkok via Doha on the B787 Dreamliner (QR196 BRU-DOH) and A380 (QR836 DOH-BKK). The Qatar Airways B787 Dreamliner is serving Brussels Airport since December 2013. 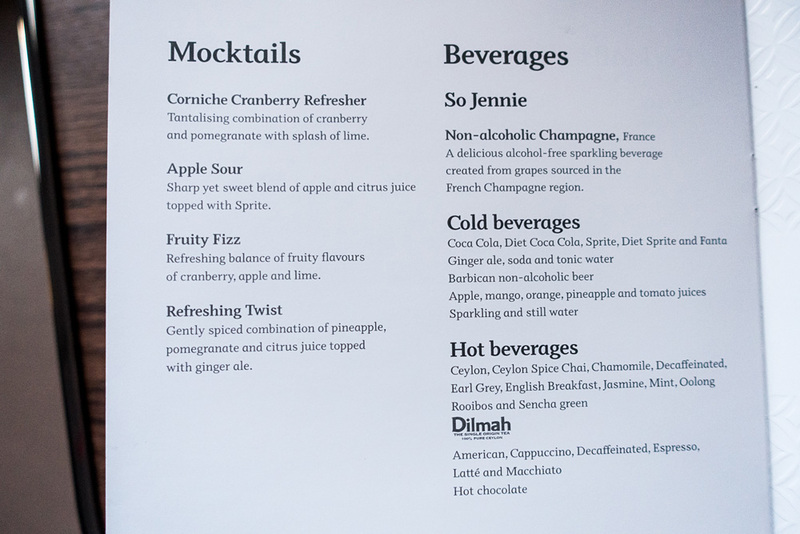 Qatar Airways, renowned for its excellent inflight beverages, was serving Billecart-Salmon Brut and 2006 Pol Roger Rosé Champagne on my Business Class flight from Brussels to Doha. They also had the exceptional 1974 Kopke Colheita Port on the menu! Forget about getting this kind of ice cream served in Business Class on one of the US or European legacy carriers! Once exception maybe: DO&CO catering onboard Austrian and Turkish Airlines. 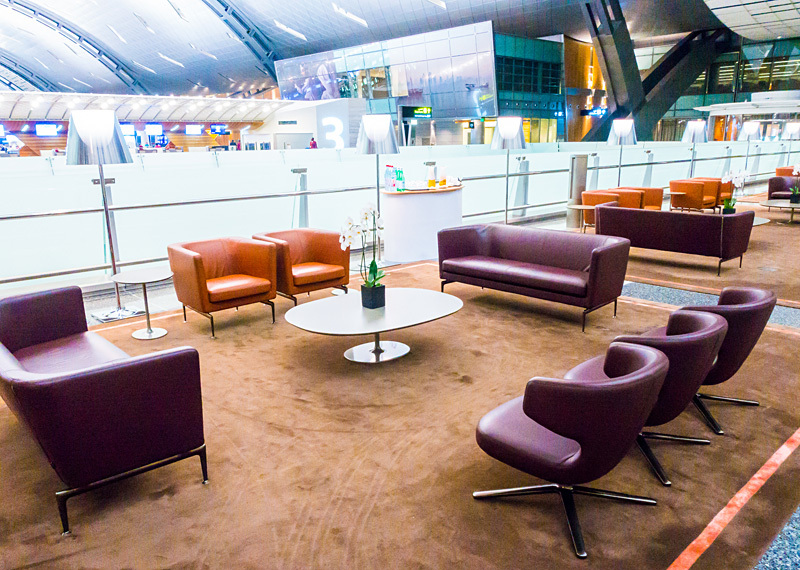 The brand new Hamad International Airport, which opened in April 2014, hosts some impressive Qatar Airways facilities. For arriving passengers there’s a stunning Arrivals Lounge just after immigrations & customs. It has plenty of seating, showers and meeting rooms. The Qatar Airways Arrivals Lounge agent arranged me a limo to InterContinental Doha The City where rates were exceptionally high that weekend due to the Doha Diamond League taking place. I used 25K IHG Rewards Club points instead of paying 1900 QAR (€481) to book my room and was upgraded to an Executive Suite. Excellent value! Confusingly, there are two InterContinental hotels in Doha with similar names. On Saturday, I moved to InterContinental Doha which has the longest private beach in Doha. I used 35K IHG Rewards Club points to book my superior room instead of paying 1030 QAR (€260) and was upgraded to a Deluxe Sea View room. I wasn’t too impressed with the service at the pool bar and lobby restaurant nor did I get my Ambassador Welcome Amenity. After complaining about it, the guest relations manager offered me a complimentary limo ride to the airport at check-out. Ka-Ching! Instagram follower Katia, who works for Qatar Foundation, invited me for a brunch with her expats colleagues and showed me around in Doha. Highlights were the Qatar Foundation campus, the Museum of Islamic Art (a masterpiece by architect Pei) and The Torch Doha. Qatar Airways has the most stylish Business Class check-in area I have ever seen. 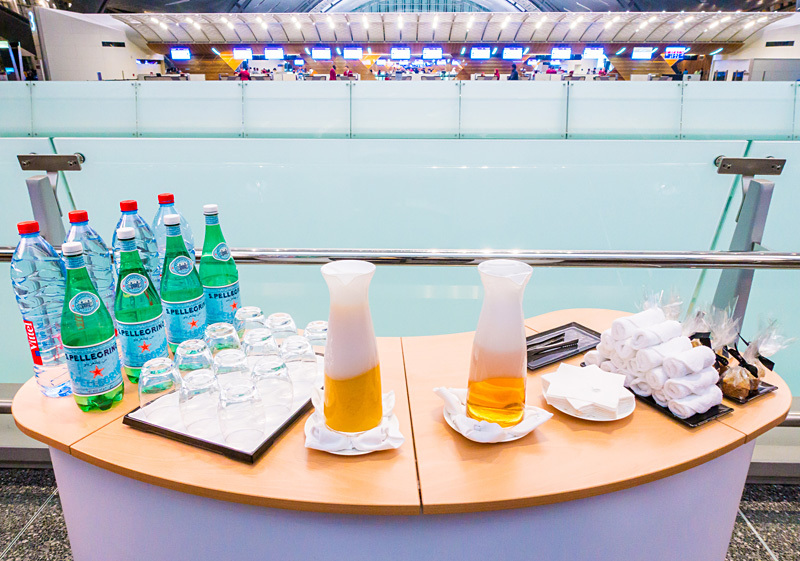 There’s plenty of seating around the check-in area with complimentary drinks and refreshment towels and you get a box of Belgian Godiva chocolates at check-in! And then there’s the mighty Qatar Airways Al Mourjan Business Class Lounge. Beautifully designed and furnished with excellent food and beverages featuring a restaurant with table service! Hidden gem in this lounge: they serve Krug Grande Cuvée Champagne on demand which retails at ~€150 per bottle! The Qatar Airways A380 aircraft has 8 First Class seats and 48 Business Class seats on the upper deck. (QR A380 seat map) I was surprised to see another 8 rows of economy class seats tucked away behind The Lounge, the inflight bar for Business and First Class passengers on the A380. I had selected business class seat 15K which looked identical to the seat on the B787. 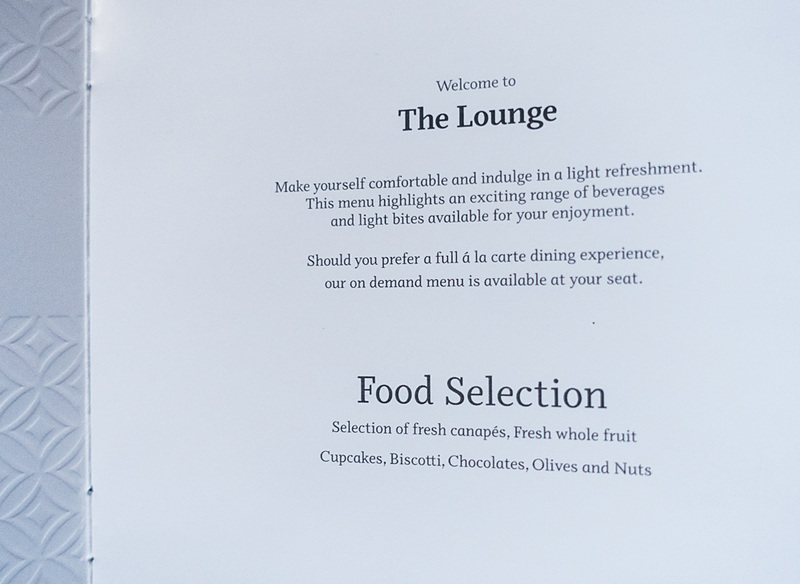 The Lounge even features its own menu: Intro & Food Selection, Champagne Spirits Wines Beers Cocktails and Mocktails & Beverages. Conclusion: It didn’t come as a surprise when Qatar Airways won the ‘Skytrax 2015 Airline of the Year‘ award at the Paris Air Show in June. Qatar delivers in terms of aircraft cabin, food & beverages, inflight service, lounges and ground services. The only area of improvement is customer service: I requested to receive some feedback about a remark I made during my first flight, but was never contacted. It’s clear His Excellency Akbar Al Baker (CEO of Qatar Airways) has a meticulous attention for detail which shows in the product his teams delivers. Qatar Airways, highly recommended for your next premium class trips! Feel free to share your Qatar experiences in the comments of this post. PS: Make sure to follow me on Twitter and Facebook to get instant updates when Qatar Airways published new low Business Class fares! Prachtige foto’s, Bart! I flew that exact same route last year (the Doha to Bangkok flight was operated by a B777 though, not an Airbus A380). I loved Qatar’s business class aboard the Dreamliner, and I wrote a trip report about it (with Youtube clip): http://wp.me/p4d1XU-DL. I think Qatar’s business class cabin design is one of the best in the skies! Hi Grzegorz, I assume we are talking about airline loyalty cards? The ‘normal’ way to obtain elite status is by flying a lot. Qatar is part of the Oneworld alliance, so you would want to look at airline loyalty programs in this alliance. You’ll need to fly at least a few times with airlines of a particular alliance to obtain elite status. In Star Alliance, the Aegean Miles & Bonus is quite interesting as you can obtain Star Alliance Gold without much flying nor do you need to spend a lot of money. Once you have this status, you can start ‘status matching’. (see http://statusmatcher.com and http://flyertalk.com for more info) This is the easiest way to obtain elite status with several alliances e.g. Turkish Airlines (Star Alliance) and Air Berlin (Oneworld) offer status matches. Everything depends on the number of flights you are planning in the next 12 months or so and the country you live at. Let me know if you have any specific questions. Enjoy your travels! Hi Bart, Aegean’s 20K fast track already expired last year, now they renewed their program and they made it harder to get the gold status (48K without A3 flights).They push you to at least have 4 flights with their carriers in order to get the 24K fast gold. And a reminder, now Alitalia is offering Status match with Skyteam. BTW, nice post as always! hi bart. Can you tell me if qatar gives you a fast track pass to go true customs on arrival in bangkok airport when you have a business ticket or do you still have to buy this seperate. is the fast track worth it? Hi Philip, as business class passenger you can use the premium immigration lane. Enjoy your trip! Thanks for your reply. I assume this is both for arrival and departure then. You’re welcome Philip. Correct, there’s a Premium Lane for both departures and arrivals at BKK airport. Currently their is a promotion on Qatar airways for business class for 1460 euro return to Bangkok. Tomas, it’s a great deal indeed. Also check the fares from Paris CDG and Amsterdam AMS to BKK. Might be even cheaper. Enjoy your QR Business Class trip! 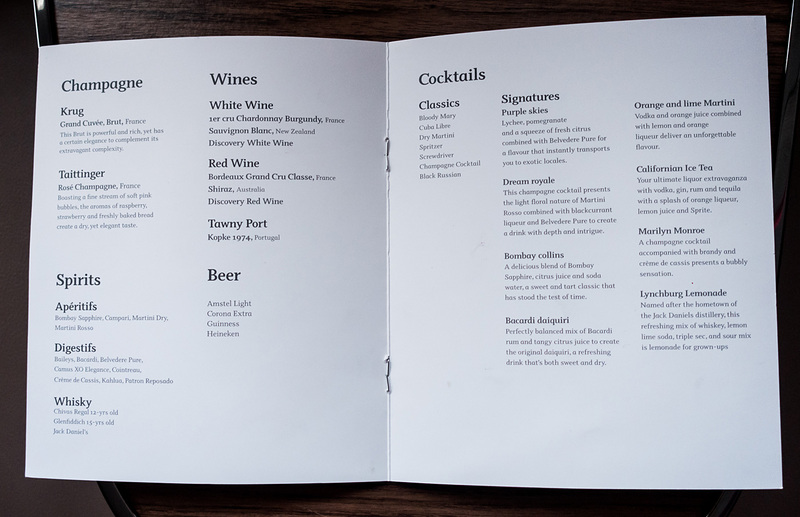 Hi Bart, is there a fee to pay for the food and drinks at the bar on the A380? Hi Lauren, all food & drinks are complimentary! Just a pratical question. I will fly Qatar business class in March from Amsterdam to Phuket. I would like to make a stopover of multiple days in Doha. Hi Tomas, depends on the fare conditions of your business class ticket. Normally you would included such stopover at the time of booking. You’ll need to check with Qatar if your Business Class ticket allows you to make a change to add the stopover. Enjoy your trip! i always travel together with my wife. For earning Qmiles is it better to enroll here as a separate member or is it better to use the family member option? Does this earn less points? I already have an economy ticket but was wondering if it’s worth buying qmiles. Just booked round trip to Australia at less than €2200 in business class. Looking forward to it. Awesome Luc! I’m sure you’ll love the onboard QR experience.